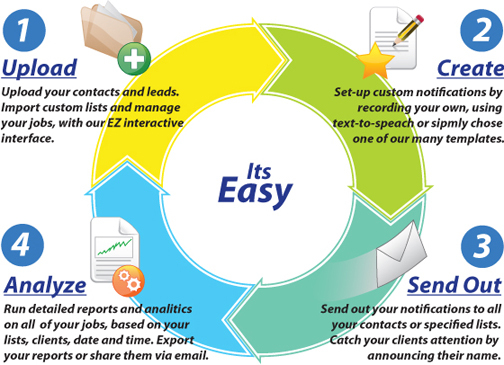 To thousands of potential customers with our Voice Notification Service, EZnet Notify. We provide economic services that allow you to customize and deliver your voice broadcast message to your audience, with immediate delivery. Enhance your Branding Campaigns , Amplify Client Satisfaction, Increase lead generation, Strengthen marketing campaigns and much, much more with 4 easy steps. Create custom Lists, by uploading contacts from an external files. Create new Lists by mix and matching your existing contacts. Catch your client's attention by announcing their name. Store client's information, and contacts. Combine our notification service with EZnet Scheduler, our online scheduling services. Include Appointment Scheduling services and enjoy a full scheduling and notification system, with Voice, Email and Text messages reminders. Create custom notifications from our templates or record your own. View reports about your jobs, clients or by department, representative. Create Analytics reports then export them into any Microsoft Office program, or share them via email. Create multi-level voice menus with custom prompts. Route calls with the Interactive Key Response feature. We can work through your existing phone- home, cell, office number or even Skype. Send your notifications to specified groups or specified contacts. All these features and more are available in conjunction with our Cloud Based Appointment Scheduling System – EZnet Scheduler. In combination with our scheduler, you gain access to an advanced business management tool, like no other on the market. Together this easy-to-use software will allow you to schedule online appointments, manage your employees and resources, run broadcasting campaigns, reduce no-show appointments with Email, Text Message and now Voice Notifications! We’ve got all you need to take managing your business from sufficient to efficient.